The critics were plentiful. They claimed Apple Music, launched in the summer of 2015 into an already-crowded music-streaming market, would never catch up to the likes of industry leader Spotify—and that it would flop. If not immediately, then soon after. The opposite has happened. A Wall Street Journal report (paywall) reveals that Apple Music, now more than two years old, is up to 36 million paid global users. 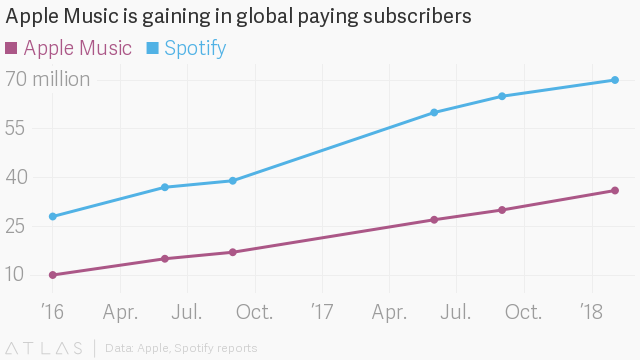 That update puts its monthly growth rate at 5%, compared to Spotify’s 2%. 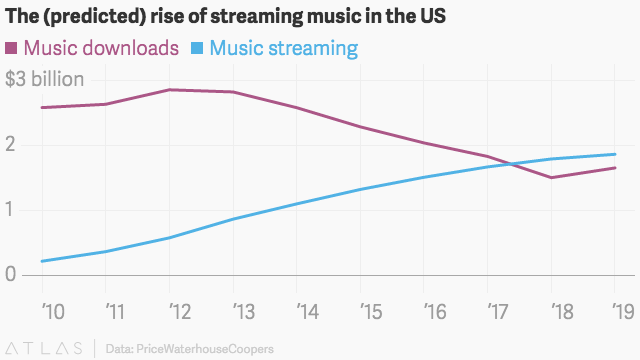 At this pace, Apple Music will be bigger than Spotify in the US—the world’s biggest music market—by the summer. Apple Music’s unexpected success contains several lessons. First, it shows that the strategy of essentially copying Spotify’s ideas, such as offering a personalized-discovery playlist, has worked just fine: The world’s appetite for streaming is enough to sustain both services, and a few smaller ones as well. It also proves that subscriptions—which ask users to pay a regular monthly fee, roughly $10 across the different services, for on-demand access to a buffet of tens of thousands of songs—are indeed the future of music. Spotify, famously, has both a paid-subscription tier and a free, ad-supported one, the latter of which has been frequently criticized because it means less money for musicians. As Spotify gears up for its long-delayed and somewhat unusually structured IPO later this year, and especially as Apple Music gains on it, justifying the continued existence of the free tier is starting to look a bit tough.